Every profession has its maxim for survival. For academics, it’s “Publish or perish.” For lawyers, it’s “Bill or move on.” What should the maxim be for employer and health plan executives in charge of providing and paying for prescription coverage benefits? Recent drug developments make the answer clear: Monitor — and comprehensively address — marketplace changes or imperil your plan’s assets and your participants’ health. Too long for a bumper sticker, for sure. Perhaps “You snooze, you lose” might be better. But regardless of the maxim’s length and pithiness, what’s clear is that in the fast-changing, high-cost prescription drug market, pharmacy benefit managers (PBMs) and payers must continually monitor and quickly and wisely respond to new drug developments. A look at three therapeutic categories proves the point. The continual stream of new drugs for hepatitis C, diabetes, and cancer has created astronomical cost exposure for payers. Therefore, PBMs and payers must scrutinize all drugs, determine those few that have demonstrated they are better than less expensive alternatives, and then implement well-grounded formulary decisions and effective prior authorization, step therapy and quantity limit programs. If payers are to control their costs, they must also ensure that their PBMs are providing and passing through the strongest available discounts and rebates, maximizing the benefit of coupons, and taking full advantage of patient-assistance programs. Eight of the newly approved drugs during the past two years were for diabetes, including four last year: Farxiga (in January), Tanzeum (in April), Jardiance (in August), and Trulicity (in September). Those approvals followed FDA approvals in 2013 for Invokana, Kazano, Nesina, and Oseni. Given that about 29 million Americans have diabetes — and that several manufacturers launched extensive promotional campaigns for their new diabetes drugs — large numbers of plan beneficiaries are already taking these drugs. However, all these drugs are far more expensive than the tried-and-true generic diabetes medications, including metformin and the three sulfonylureas (glyburide, glimepiride, and glipizide). The generics may cost health plans from $4 to $50 per 30-day prescription. The new drugs are likely to cost several hundred dollars for the same treatment period. Comparing the average wholesale price (AWP) by unit: For metformin, the unit AWP ranges from $0.70 to $1.44 (depending on dosage level); for Jardiance, it’s $12.04; and for Invokana and Farxiga, it’s $12.48. Drugs to treat cancer are also putting enormous financial pressures on health plans, patients, and their families. According to a recent newspaper investigation, the FDA approved 54 new cancer drugs during the past decade. Those drugs had an average monthly cost of $10,000, with four priced at more than $20,000 and one at $40,000 (Fauber 2014). While politicians, providers, and payers raised a hue and cry about Sovaldi’s $1,000-a-day price tag, there’s been barely a murmur about the cost of Celgene’s two multiple myeloma drugs. 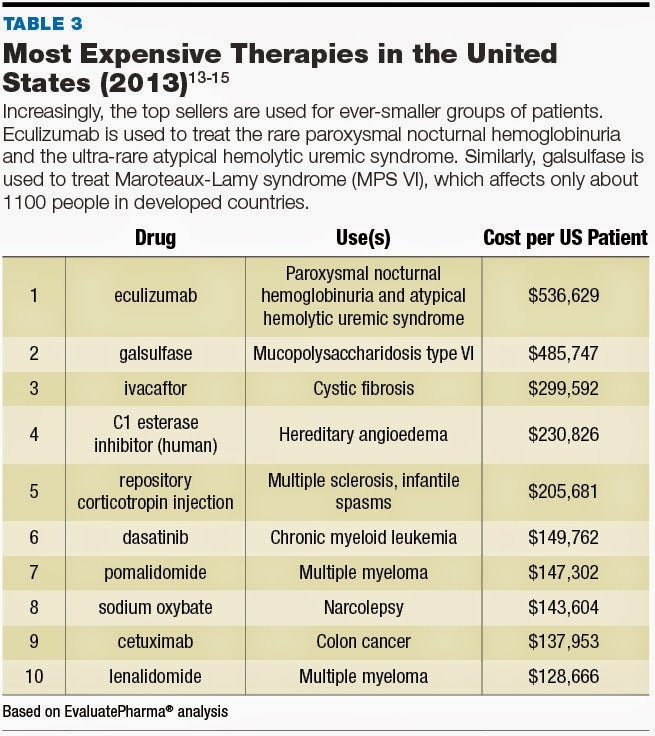 Pomalyst costs about $147,000 per patient per year and Revlimid costs about $126,000 (Palmer 2014). Merck’s advanced colon cancer treatment, Erbitux, is in the same league, with a price tag of about $138,000 per patient per year (Helfand 2014). Because of the staggering costs of an ever-increasing number of drugs, providers and payers can’t afford to be caught flat-footed when new drugs hit the market. They must respond and do so quickly. The question is: What can — and should — they do? Often with medications, the latest may not be the greatest. So the first step every provider and payer should take is to ascertain the facts about the efficacy and safety of every new high-cost drug. Sovaldi and a few other high-cost products, like Gleevec, the chronic myelogenous leukemia drug, represent remarkable medical advances that can improve health and extend life with limited side effects. Payers and providers alike must do what they can to ensure that people who can benefit from such drugs have access to them. That’s not true for all new drugs. When the FDA approved the eight new diabetes drugs mentioned above, the FDA — as is so often the case — did not require any to show that it was better than diabetes treatments that were already available. In fact, almost no new drugs are tested against anything other than a placebo. Thus, at the time of approval, there was no clinical basis for any physician, patient, or health plan to believe that these new high-cost diabetes drugs are superior to generic drugs that are far less expensive. Moreover, when the FDA approved these diabetes drugs (as with most new drugs), there was little known about their mid- and long-term safety and side-effect profiles. New drugs are typically tested in clinical trials that enroll between 600 and 3,000 volunteers and last a matter of a few weeks or months. That is not a large enough sample size — or enough time — to get a full picture of a medication’s safety and side-effect profile. While many PBMs may have staff members who know the efficacy and side-effect profiles of newly approved drugs, PBMs make little, if any, of that information available to payers and tend to share even less with plan participants. Why PBMs stay silent is difficult to understand, considering the benefits that would result were they to speak up. If basic information about drug efficacy and side effects was provided, payers would likely be more willing and adept at implementing cost-control measures like formulary exclusions and step therapy. With clear, concise information at their disposal, beneficiaries might be more accepting of health plan strategies to manage pharmacy costs. And with a steady diet of solid efficacy and side-effect data, physicians might also shift their prescribing patterns. Information dissemination by PBMs might also have a positive influence on drug manufacturers. If PBMs posted information about each high-cost drug on their Web sites, openly stating when accurate that there’s no evidence that a new drug is better than generic alternatives, wouldn’t drug manufacturers have a greater incentive to test their new drugs against generic drugs? And wouldn’t millions of people with cancer be far better off if PBMs posted explanations of the efficacy and side effect profiles of cancer drugs? Every PBM should consider generating and disseminating such information. If they don’t, payers should consider pressuring them to do so. Most people with hepatitis C are asymptomatic and not at risk for suffering a serious health problem because of the disease. A significant proportion (15% or more) of people with hepatitis C are likely to clear the infection spontaneously. The remainder are not likely to become symptomatic or harmed in any way from the disease for many years. The cost of hepatitis C treatment was likely to decline in the future because several other treatments were likely to be approved, and some of the treatments were likely to be an improvement over Sovaldi. Knowing the above facts, as soon as Sovaldi entered the market in December 2013, all PBMs and payers should have implemented effective programs to curtail use immediately. They should certainly have such programs in place by now. Many still don’t. Implementing strict treatment criteria. Most of the 35 states have a prior authorization program requiring a liver biopsy to determine disease severity. Only if the threshold for treatment is set high will liver biopsies have the intended effect of guiding treatment to the approximately 25% of individuals who need immediate treatment and delaying treatment for the approximately 75% who do not. Imposing an abstinence period before Sovaldi treatment. Many hepatitis C patients have a history of substance and alcohol abuse, which can eliminate the utility of Sovaldi. Therefore, it makes sense to rely on urine tests to verify that Sovaldi candidates have abstained from drug or alcohol use for three months. Alaska imposes such a requirement, but most states do not. Precluding use of certain other products. Sovaldi’s effectiveness may be reduced if people take Sovaldi at the same time as certain other medications. Illinois has numerous prior authorization criteria to address such concerns, but most states do not. The researchers who conducted the review of state Medicaid programs also found that few states have implemented effective quantity limit programs. Illinois limits dispensing to two weeks. Louisiana dispenses 28 units at a time. Most other states have no such requirements. Because almost 1 in 10 patients appear not to finish their treatments (Brennan 2014), it makes no sense to dispense a full 12- or 24-week Sovaldi regimen. Payers can also take steps to make sure other new and expensive drugs are used appropriately. For example, each of the eight previously mentioned diabetes drugs should be placed on a higher tier, unless the PBM can demonstrate that rebates will decrease the cost of one of these drugs to the point where it’s the same or less than therapeutically similar, lower-cost products. Effective step therapy programs should also be implemented, requiring beneficiaries to try lower-cost diabetes drugs first. Also, if a participant does try a first-in-line, lower-cost treatment and is then allowed to use a new higher-cost drug, it should be dispensed in relatively small quantities. A new medication may not be effective or may have adverse side effects. As a result, there may be significant waste of the high-cost drug if no quantity limits are imposed. Health plans should also require their PBMs to implement partial-fill programs for oncology drugs to prevent potential waste. A recent survey of 91 health plans showed that less than half had implemented these programs. With such contract terms in place, every plan executing a contract after Sovaldi entered the market would now have in place an aggressive AWP discount for Sovaldi of at least AWP minus 17%. Moreover, when the FDA late last year approved two new hepatitis C drugs, Gilead’s Harvoni and AbbVie’s Viekira Pak, every plan would have known that its PBM would automatically provide a default discount when the first prescription of each drug was dispensed. Payers would have also known that they could quickly negotiate improved discounts on Harvoni and Viekira Pak if such discounts became available. If a PBM wouldn’t provide a competitive discount, a payer would have known it could carve out drugs like Harvoni and Viekira Pak and have another specialty pharmacy dispense them. The second way for a client to reduce its drug costs is to contractually require its PBM to pass through and disclose to the client 100% of rebates, as well as all other third-party financial benefits (like discounts) that the PBM receives. Unfortunately, even if a PBM–client contract requires a pass-through of rebates, it often doesn’t require the pass through of other financial benefits or drug-by-drug disclosure of the amounts passed through. As a result, most PBM clients can’t compare the net costs of therapeutically similar drugs. If it’s a rebate, Express Scripts will likely pass on most of the savings to its clients, but if it’s some other form of financial benefit (like a discount), then it may not. Thus, unless payers’ contracts with Express Scripts mandate a 100% pass-through of all financial benefits that Express Scripts receives — and full disclosure of all such financial benefits — payers may not be able to discern whether their net cost for Viekira Pak will be higher or lower than their net costs for Sovaldi or Harvoni. Finally, a third way PBM–client contracts can be written to save clients money is to make sure that they let clients take full advantage of marketplace coupons. There are now approximately 560 coupon programs for more than 700 brand drugs (Starner 2014). The current Sovaldi coupon covers up to 25% of the drug’s cost. For diabetes drugs Jardiance, Farxiga, and Trulicity, there are coupons that can result in savings of up to $325 per month, $373 per month, and $150 per month, respectively. There are also coupons for numerous oncology drugs. PBM contracts should let plans use a coupon’s value to decrease the plan’s total costs, the beneficiary’s copayments or coinsurance, or both. Suppose, for example, a drug costs $500 per month, and a participant would normally be required to contribute as a copayment, say, $60. Normally a plan would be left to pay the remaining cost of the drug, or $440. If the plan requires the PBM to use a coupon that is worth “up to $300 monthly” to benefit the plan, the PBM would be required to raise the participant’s copayment to $360 (the previous $60 copayment plus the coupon’s value of $300). This would mean that after the participant uses the coupon, his copayment would still be $60, but the plan’s total cost would only be $140 ($500 minus $360) instead of the $440 the plan would have otherwise paid. Alternatively, a plan could require the PBM to use the coupon to benefit both the participant and the plan, in which case the PBM would artificially raise the participant’s copayment to $300. This would mean that when the coupon was used, the participant would pay nothing, but the plan would be left to pay only $200 ($500 minus $300) instead of the $440 the plan would otherwise have paid. While PBMs may not be positioned to process all — or even most — available coupons, PBMs certainly can do so for those drugs that represent their clients’ largest costs and that are being dispensed by PBM’s mail and specialty drug pharmacies. Sovaldi and other high-cost drugs also show why every plan should ensure that its next PBM contract requires the PBM to provide information about patient-assistance programs (PAPs). There are now hundreds of PAPs. Plans with lower-income beneficiaries may be able to exclude high-cost drugs from coverage entirely, and instead have their beneficiaries rely on a PAP to obtain access to expensive medications. Unfortunately, many PBM contracts don’t contain any of the above described provisions, and virtually no contracts contain all such provisions. ln fact, in my experience reviewing hundreds of PBM contracts, almost none contain a list of every existing specialty drug with a mandated AWP discount for each drug. Very few contracts require PBMs to pass through and disclose 100% of all third-party financial benefits, not just rebates. New-to-market default discount guarantees are virtually nonexistent, as are the rights to renegotiate and carve out drugs. Almost no PBM contracts say a word about PBM responsibilities related to coupons and PAPs. It’s time for payers to demand all these contract provisions so that they are positioned to address the explosion of high-cost drugs.